From 1973-1976 my father was an Air Force Chaplain stationed in Bitburg Germany. During those years I was able to see many historic sites in Europe and I was always particularly interested in anything to do with World War II. 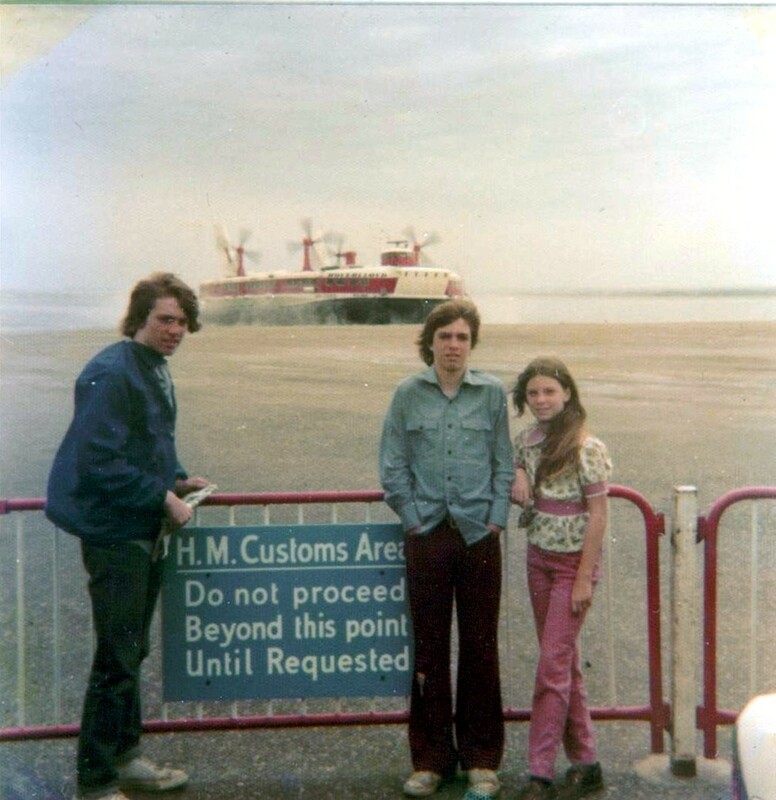 In June of 1975 my family drove to France boarded a ferry and crossed the English Channel to the United Kingdom. The ferry crossing would be a chance to experience an exciting combination of new technology and to re-live a little history. In 1975 the Hovercrafts were a relatively new technology that had cut the time it took for a ferry to cross the English Channel in half. The history to be re-lived would be crossing the English Channel. In preparation for this trip I had re-read a couple of books, one on D-Day and the Normandy Invasion and the other on the battle of Britain. Yes, I was a bit of a history nerd even in High School. It would have been really cool to have crossed the channel on the June 6th anniversary of D-day but we were a couple of weeks late and crossed from France to England on the 17th of June. We crossed on smooth seas in a high-speed hovercraft operated by Hoverlloyd. All the way across the channel I was thinking about the soldiers and sailors packed in thousands of ships not knowing what awaited them on the coast of France. Of course we were headed in the wrong direction and I look forward to the return trip as it would be a more realistic illustration of the soldiers experience in World War II. I could not have imagined just how real the return trip would be. We spent the next few days in London and headed home on June 22. In June 1944 the Allied Expeditionary Force Supreme Commander Dwight D. Eisenhower had originally designated June 5, 1944 as D-day but on June 4th the English Channel was covered with high winds and rough seas that made the landing impossible. Most of the ships could have crossed the channel safe enough but they would never have been able to launch landing craft. The troop convoys already at sea were forced to weather the storm along the coast of England. The soldiers and sailors were trapped on these ships and were at the mercy of the sea. The book I read on D-day graphically described how rough the channel crossing was and how sick most of them men were. On 5 June, Eisenhower’s chief meteorologist (Group Captain J.M. Stagg) had good news. Stagg forecast a brief improvement for June 6th and Eisenhower ordered the invasion to proceed. When we were waiting to board the Hoverlloyd for the return trip to France the wind was blowing hard. We were dressed for spring and the cold damp wind cut into your clothes and forced you to hold your breath. On the trip from France to England we had been allowed to roam around the boat but when we boarded on the way home they asked us to move to a seat. We were headed for the coast of France in rough seas. This would be a very special kind of living history. When we left the beach the crew began distributing stacks of five gallon paint buckets around the hovercraft and asked anyone who felt sick to raise their hand or otherwise signal for a bucket. There may be writers gifted enough to describe a storm at sea but I suspect there are few and I am certainly not one of them. Before this trip I had read about waves crashing over a boat or ship and I had an image in my mind of how that would look. I had imagined the sort of waves you experience in the surf, waves rising up, moving across the water, and then collapsing. This was very different. As we passed across the surface of the sea, giant caverns would open in the sea in front of our boat. The hovercraft would struggled forward, surging out over the watery cliff until finally it reach a point where it would tilt and dive down into the enormous pit. For a split second the boat is submerged, and then it explodes up through the water and on to another precipice, pausing a moment and then down, down, down again into the sea, over and over again for hours. More and more people were sick and the ship was closed tight. It was hard to breathe. I sat with my head pressed against the cold outside wall of the boat trying to ignore the sights and sounds around me. I thought of the men who landed and fought at Normandy focusing on their sacrifice seemed appropriate and it seemed to help me keep from getting sick. I enjoyed my trip to England immensely and I am glad I got to feel what it was like to cross the English Channel in a storm but I would never sign up to do it again. When I began writing this blog post I was focused on sharing a little about D-day and my own channel crossing experience as it related to World War II but I discovered that the hovercraft ferries are no longer in service and they have gone the way of the steamboat and are now as much a part of history as World War II. I salute the men and women of D-Day as well as those who served on the hovercraft. It was an exciting way to travel. During World War II, Olga Baker Armand Griffith, was one of many women welders that took their place working along side the men in the shipyards of this country. This is her story in her own words. Her memory was beginning to fail her when this was film so we have spliced together two separate discussions to tell the full story.